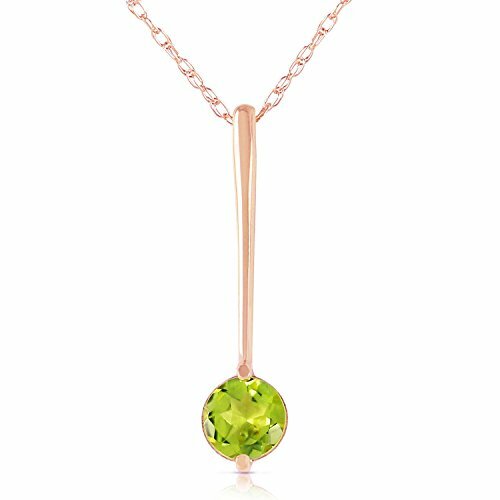 Simple and sleek is the winning formula that makes up this 14k rose gold necklace with natural peridot. A beautiful gold bar is smooth and sleek with a modern design that is made of 14k yellow, white, or rose gold starts off thick and gradually tapers down until it reaches the beautiful round cut genuine peridot. The gem weighs .6 carats, making it a great size that is not overwhelming to the design of this necklace. An 18 inch rope chain is included with this piece, which is made of high quality gold and perfectly matches the pendant that sits upon it.